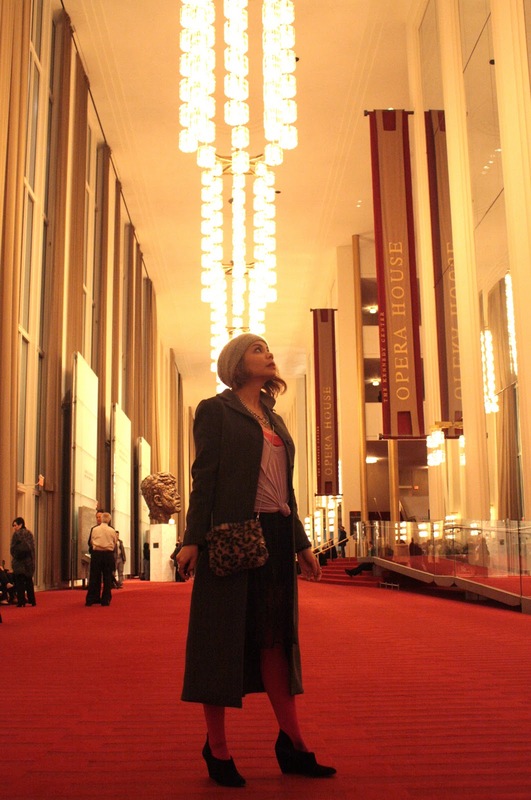 I got to go back to the Kennedy Center over the weekend for more art enlightenment! This time I saw La Cage aux Folles, the musical The Birdcage was based off of! Best of all, George Hamilton himself was playing Georges, the Robin Williams character (renamed Armand in the movie). There were selling boas at the giftshop, but I really wanted those pink boots! They also had signed copies of George Hamilton's book, Don't Mind if I Do. It's so big in here! I decided to try out this whole knot the bottom of a shirt thing with one of my cotton tees. It got a teeny bit stretched out, but here's to hoping it will all fall back into place once it's washed! I'm wearing: Pink cami from United Colors of Benetton, knotted LnA tee, lace skirt from Pretty People Vintage, Belle by Sigerson Morrison shooties, Lovers + Friends faux fur purse from Revolve Clothing, Dolce & Gabbanna maxi coat, necklace from Last Call, Jimmy Choo for H&M cuff, and a ring party instead stacking on the bracelets! Let's see, some Banana Republic stacking ring, along with a gold band and my rose gold Tina Tang wedding band, many a super old ring from high school, and my engagement ring! Love this skirt - a mini made just slightly more modest and somehow sultrier with a longer lace overlay! Wish I had those legs! I saw the show with my bestie Julie and her sister Monica. It was a riot and the performances were top notch. The men were fierce, the music catchy and I just about died over the costumes! It was a spectacular show and I highly recommend to everyone! I've been amassing floral print pieces to feature all together, but I couldn't stop myself from posting these girl. by Band of Outsiders pants on their own! 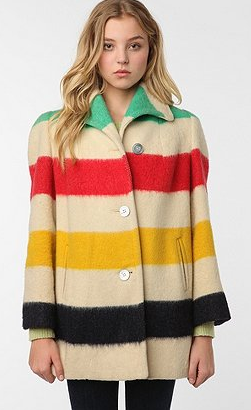 Super cute and comfy looking, they're on sale at Les Nouvelles for $189 and I imagine will sell out quickly! 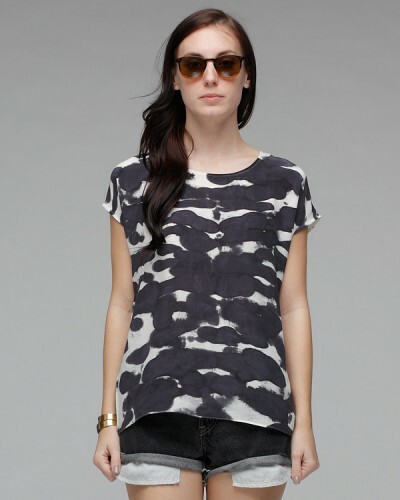 Ooo this top reminds me of a Rorschach ink blot test! Buy this hand painted piece at Need Supply for $133. Need something to add a bit of edge to your outfit?? 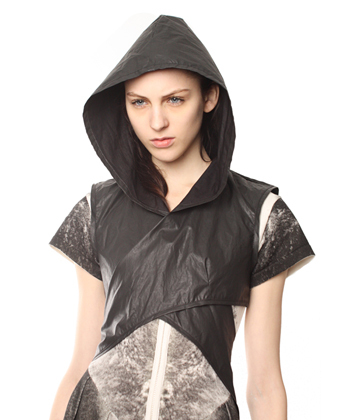 Throw on this silk nylon wrap vest with a chic hood! Ooo, it' almost sold out already, but for $115 at I Don't Like Mondays. 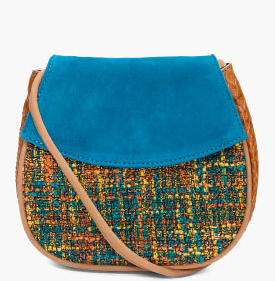 This just feels like the perfect spring bag, don't you think? Love the colors and the snakeskin texture on the sides! Buy at Ssense for $115. 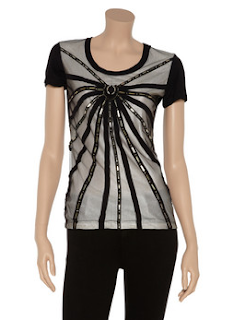 Love the embellishment on this tee - fancy enough for a party if pair with a skirt, nice enough to rock to the office with a blazer, great for jazzing up some jeans! Buy at theOutnet.com for the sale price of $158, originally $395!! 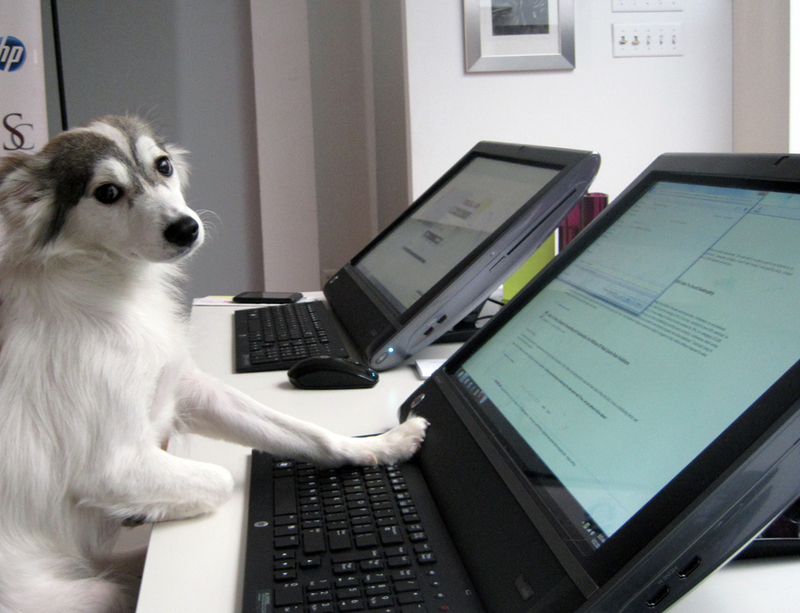 Next up in the Fashion Dogs Interview Series... Luna of Style Coalition and My It Things! Mommy Yuli found this one-year-old Siberian Husky, American Eskimo, Duchshund mix on PetFinder.com last May. Rescued from North Carolina with her two sisters and fostered by a nice family upstate NY, her two sisters got adopted quickly. But Luna was more on the shy side, so no one wanted her.. until Yuli & her forever family saw her - it was love from the first sight! Since then she has quickly adopted to her amazing life in in NYC! I spend most of my days at the Style Coalition office, and go to daycare few times a week, where I play with my boyfriends Nike and Luke (keeping my options open). In the evenings I love hanging out with my dog run friends at the Washington Square. On the weekends I like to take a stroll around Soho or invite my weekend boyfriend Gustav to chill on my roof deck. My social calendar tends to get pretty busy. Does your human ever dress you up? 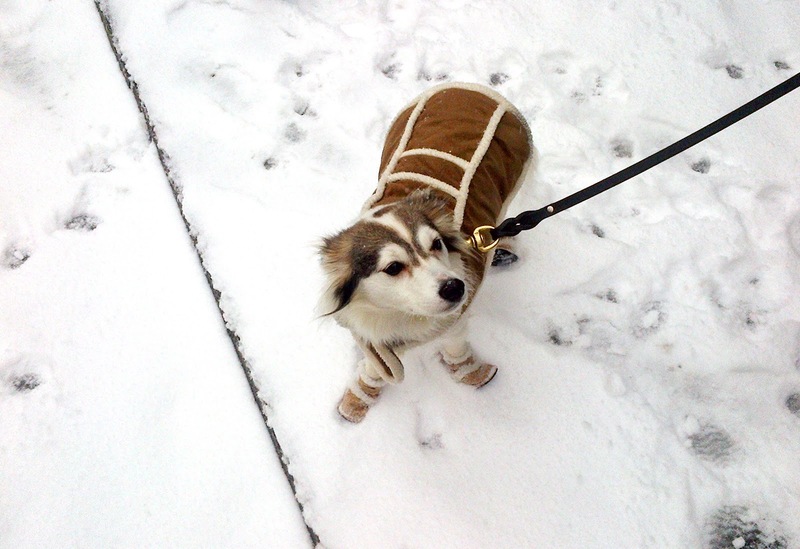 Yes it gets chilly in NYC, so I got a nice shearling coat, and Gustav sent me matching booties for Christmas. What designer's upcoming collection has you panting in anticipation? My style is more on the classy side, so I don't really follow trends and runways. I'm a digital savvy pup, so Wag.com is my fav shopping destination! If you could piddle on one fashion trend you hate, what would it be? Slogan tees! Who likes being a billboard? Not classy.. I've done a lot of work getting out of my fashion comfort zone, and I think I should try to tackle sheers next! This skirt is a perfect starter piece as it's only $42. Hmm, I could wear over a bright bodycon mini, or perhaps a pair of shorts? Buy at Edge of Urge. 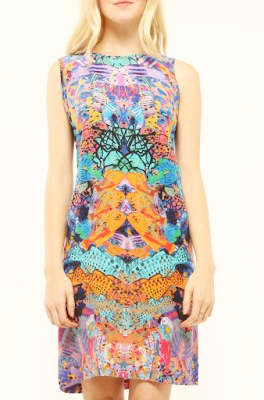 As I've mentioned before, kaleidoscope prints are the print to have for spring! SO of course I come across this dress and immediately covet - alas it's a pricy $375 at Wasteland. I didn't know Anna Sui did a collaboration with Hush Puppies. 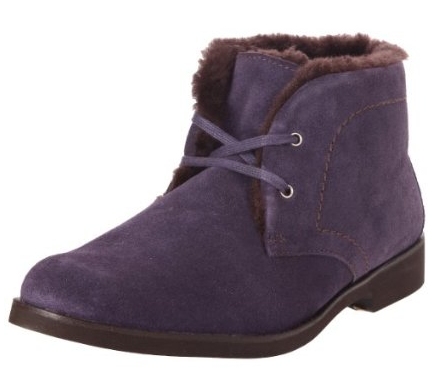 These boots look nice and toasty and so chic in dark purple! Buy at Endless for $145. Designed by Nary Manivong and Alexandria Hilfiger (yes, THOSE Hilfigers) NAHM is definitely an up-and-coming brand you should be watching! If this was in my price range right now I would snap it up in a heartbeat for NYFW! Love the rounded shoulders, which are coming into style but really hard to search for, and the stripes! Buy at Urban Outfitters for $259 - if only I didn't have bills to pay! I know winter will probably get worst for most of us before it starts getting springlike outside, but I can't help but start dreaming of warm weather colors! Like last spring I'm all about the icy pastel, this season mixed with sheer grey pieces! Loving the oversized plaid print on this blanket cardigan!! Looks super cozy but chic enough to belt and wear out too! Perfect for days like today where you couldn't get dressed because they weren't your PJs... or maybe that was just me :P Buy at Gap for the sale price of $60. Ooo, get an extra 30% off sale items with the code GAPFUN before 1/27 too! 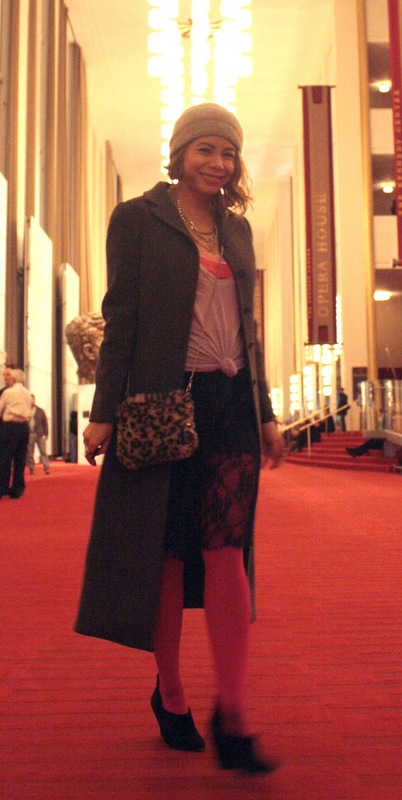 Not all print pants have to be in your face "fashion ugly" to be chic! This pair is pretty subtle but definitely way more fab than a regular pair of black pants. Best of all, they're just $40 at Mikkat Market! I don't really like to carry clutches, but I can't deny how fabulous they look! 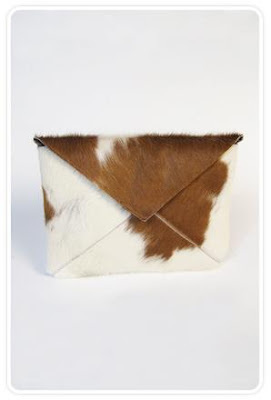 This cow clutch is unique in a very amaze way - definitely a head turner! If only it wasn't $440 at Goldyn... all the fun items are super expensive! Last night I went out to the January CapFABB meet-up at Madewell in Georgetown! Of course it was important to dress chicly, but I didn't want to stress too much about it since I had so many NYFW outfits to plan! So I hadn't planned on taking a picture of my look, but after wearing it all day at work it really grew on me and I might as well post one shot! I'm wearing: Rag & Bone chambray shirt and printed leggings (the Mr called these pants "man repellent" ha), blazer from Urban Outfitters, red tank from Banana Republic, turban from ASOS, Foley + Corinna city tote, Robert Clergerie boots. Jewelry includes vintage Gucci watch, Juicy Couture leather wrap bracelet and chain bracelet, tiger print and rhinestone bracelets from CUSP, and my beloved Mockingjay pin! Of course, my fellow CapFABB ladies all looked super stylish! Maxi skirts were out in full force! And I love Marta's clutch and fuzzy accessories and Alina's glasses and belt! Lacey of A Lacey Perspective rocked a seriously killer printed suit! Janice of Facon Magazine looked winter chic - loving the palette, especially the white pants! And that's a great coat! Speaking of..
CapFABB-ers have some killer outerwear!! Never underestimate the importance of a stand-out coat for winter! Well this is an interesting idea! 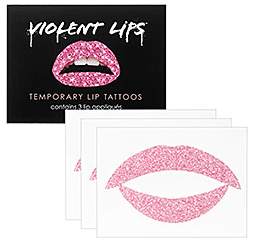 Glittery temporary lip tattoos would certainly stay on for long periods, though I've never tried one myself. I think I should test these out, they're only $7 for a pack of three at Sephora and come in pink, red, gold, silver and blue! Neon brights always seem to be coming into style, but I suppose adding a small pop of vibrance to a look is rarely a misstep! It looks especially fresh in the winter / spring time when paired with grey or white. Here are some of my fave pieces right now! I've been obsessing with colorblocking for the past few weeks!! This bright blouse is super standout and only costs $16 at Forever 21. 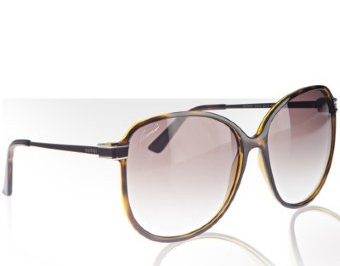 I've been on the lookout for a pair of nice statement sunglasses since I haven't bought a super nice pair in years! That's a reason to buy stuff right? Anyhoo, this Gucci pair caught my eye - talk about ridiculously oversized! Buy at Bluefly for $196, originally $245, and only one pair left! Very into this Stolen Girlfriends Club crop tee! Crop tops are coming into style.. at first I was very anti crop top, but I think if it's just long enough & styled right it can be tres cute! Buy at Pixie Market for $139.